Infrared surveys are an exceptional non-invasive tool for diagnosing problems with commercial, industrial and residential structures. 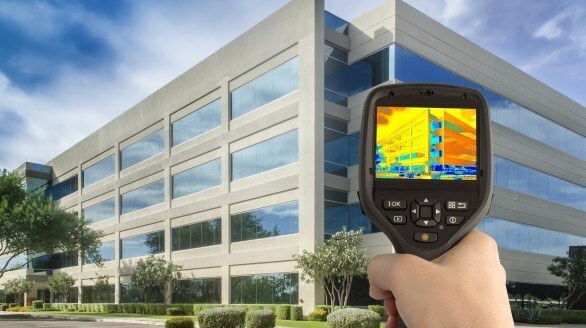 Issues related to water intrusion, insulation defects, construction quality, air infiltration and more can be seen in real-time using current thermal imagers. Building products and materials are not always installed properly. Surveys can be performed prior to commercial operation to help find and resolve problems before contractors leave the site. The images above show a poorly constructed masonry wall. Thermal surface patterns can reveal missing concrete at pilaster and beam locations. Infrared is a valuable tool in verifying construction quality in these wall systems. The images above show insulation defects in a new home. IR cameras can quickly locate these defects within wall or ceiling spaces. This non-intrusive technique can help solve living space comfort issues, HVAC problems, plus others. IR is also a powerful tool when attempting to solve high energy cost issues. Above is a low-sloped roof with moisture beneath the surface. When roof membranes leak, rainwater enters the top layer and is absorbed by underlying materials. Unchecked, this moisture will render insulation ineffective and cause decay of the roof deck materials. These defects are easily found with the IR imager. Infrared inspection of roofing systems has proven especially valuable to pinpoint problem areas within roofing structures as well as the extent of moisture penetration. The images above show water behind the wall. Locating the source of moisture intrusion is the primary goal of the IR survey. No more time or money wasted tearing out walls or ceilings just to locate the point of intrusion. Stucco Finish System surveys can help locate moisture beneath the surface of this popular exterior finish. No destructive testing necessary and tenants are never moved. The survey is totally non intrusive. Entire multi-story building elevations can be at once, in real-time. EIFS (Exterior Finish and Insulating System) and conventional stucco systems can be surveyed to help locate moisture beneath the surface. The image on the right above shows indications that water is migrating down the roof flashing and around the window frame. You can see no defects or staining in the visual photo. Air infiltration / exfiltration and how it affects living spaces can be seen with the IR imager. The images above show a defective AC return air duct in a single story home. Hot air is being drawn down and into the duct from the attic, causing the system to run more than normal and perform poorly. Inspection revealed poor sealing of the duct. This defect was easy to fix once found. Electrical panels, circuit breakers and wiring problems can easily be seen with thermal imaging. Above is an image showing such a problem. Circuit breaker and wiring are over loaded, and plainly visible using a thermal infrared camera. Learn more about the benefits of our infrared inspection.